Well folks it is official, this is the year of the bountiful cornucopia, the horn of plenty in Southern Ontario. The year of abundance that every wildcrafter, harvester in the wild, dreams about. With all the rain and sun and rain and sun and rain and sun and warmth and rain (and thunderstorms), we are having a bumper year for all the wild fruits and flowers. I have never experienced such a bounty in decades as there is right now around us in southern Ontario. .
St. John’s Wort everywhere. To name only a few that come to mind. If you have kids make sure to grab them and go out and harvest raspberries, BlackBerries and mulberries, Right NOW! This is THE year to do it, so don’t miss this very unique window of opportunity. 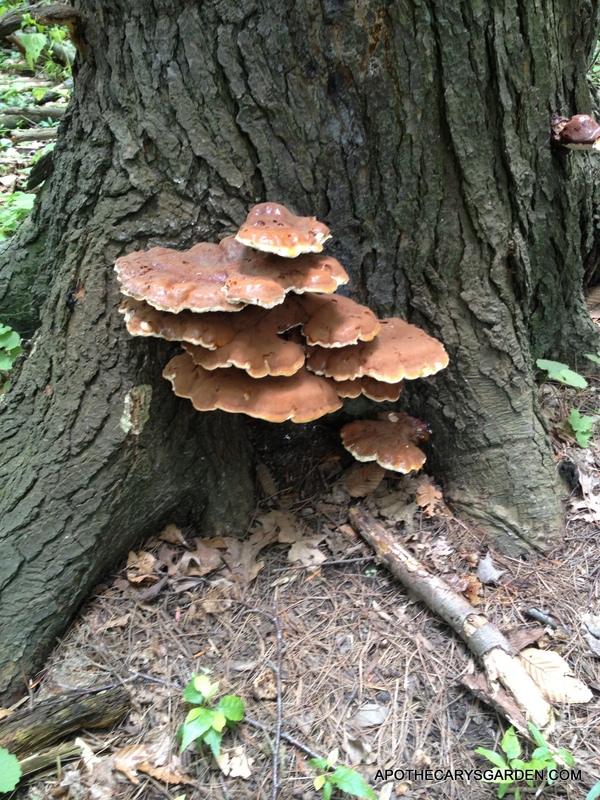 If you know your mushrooms, go out and hunt them because they are everywhere! If you don’t know your mushrooms make sure you get some good books because this is the perfect year to learn about them. Let them teach you. They are waiting for you. If they don’t enrich your diet, or boost your immune system, they will most definitely enrich and boost your spirit and mind. Nourish your soul. In 30 years I haven’t seen the wild raspberries as luscious and laden with fruit as they are now. I really am blown away here! Every Little flower has flowered and turned into a berry, and every little raspberry has grown and grown to become plump and juicy and ready to be harvested. This window will only stay with us at the very most for three weeks. So please, grab kids, buckets and baskets, make room on your kitchen counter and in your fridge and freezer and make sure you get out there A.S.A.P. Wild Raspberries with Icecream,,Whipped cream! If you have kids grab them and go. Don’t wait! Don’t procrastinate! If you don’t have kids then grab your neighbors or your in-laws kids, (with their permission), and take them out to harvest wild raspberries and wild mulberries. It will be an experience they will remember for the rest of their lives. An initiation into Nature that is meant for them. One you are meant to facilitate for them. You are their high priest or priestess in these matters of the spirit. you are their initiator into the mysteries of Nature that must be experienced and cannot be taught with words. These are experiences that will touch them, move them, shape them and connect them with Nature, open their minds hearts and spirits.It will help correct some of the misconceptions and behaviours our culture has programmed into their young minds, replace video games and internet with experiences that truly nourish and nurture their minds and spirits. Summer is here and it’s the perfect time to do stuff with your kids, you don’t need to go far. It doesn’t cost anything and there’s nothing like going out and introducing them to nature, bringing the harvest home, and showing them what they can do with it. These are the things we need to teach our children. Because if you do this for them, they are going to do it for their kids and the world will be a better place. Don’t miss this opportunity. They need a relationship with nature to ground them amidst all our technology and busyness. The wild raspberries are usually small and dry but very flavorful every year. Sparse, but worth the effort. But this year they are huge, perfectly formed, succulent, juicy, sweet, flavorful and truly abundant. Every raspberry flower must have flowered, and each one must have been fertilized. Every cluster is now full with rarely a fruit missing from the perfect spiral of fruits, lined up to serve you a fresh berry every day. Perfectly paced for three weeks of incredible abundance and bounty. What a show of perfection and fertility. The Mulberry trees are laden, branches bowed, bent in offering. Grab a sheet or tarp, spread it underneath the tree and shake a bough. You will, in ten minutes, have enough Mulberries to feed the family, Make a few pies, a few liters of wine or a refreshing summer syrup. Have you noticed that each Mulberry tree offers slightly different fruit? It is very noticeable this year. Subtle differences in size and texture of each tree’s fruit. Different shades of tartness and flavour, and they are all cram packed with Mulberries, Right now. They will only offer us their bounty for another 2 weeks tops folks, that’s it! So now is the time to get out there. The price we may have paid for this bounty is the daily rain, so you will have to time your forays wisely and in between thunderstorms and downpours. But it is definitely doable and worth it. So get out your recipe books and your grandmothers recipe books. Burn up your internet bandwidth and hunt for recipes online. Prepare yourselves and get your kids hyped up. There is no missing the mark this year. We are shooting in a barrel of fish, surrounded by abundance. So if you screw up a recipe, just go get more. This is the year to make Mulberry wine, Mulberry jam, raspberry syrup, raspberry jam, raspberry wine, raspberry tarts, and well,, raspberry everything. Don’t wait or hesitate. Don’t put it off till tomorrow because it will all be gone soon. And it looks like in a few weeks in the fall we are going to have a huge harvest of wild grapes so start preparing now for that tart flavourful harvest to come. (Wild grape jelly, Vinegar, Syrup!! Yummm). If you’re into St. John’s wort and you want to try harvesting your own herb, or making your own healing oil, this is the year to do it! 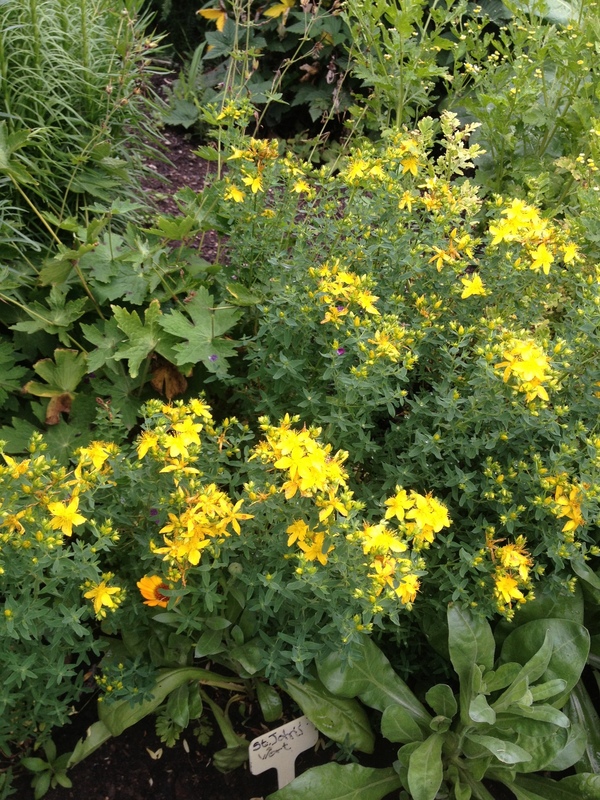 I have never ever in all my years of foraging, wildcrafting and harvesting ever seen such a local abundance of St. John’s wort yellow flowering vibrance everywhere around. It is impossible to miss it. It’s just waiting patiently, For You! (You know who you are), So folks, If you are going to do it, this is the time to do it. Always give something before you take, and show your children how to treat nature with respect. As they would like to be treated, as equals. Treat the plants with care and respect. Don’t slash, break or trommel plants to get their fruit. Only collect as much as you can use. Whatever you don’t use or have left over after cleaning and processing, goes back to the earth. Not a garbage bag. Stay away from old industrial sites and heavily travelled roadsides, railroad tracks that may have had spills or have been sprayed. Have a look at the post- “9 tips for making a kickass wildflower wine”, for wildcrafting guidelines. will never need to convince them to leave the computer screen and come explore nature again. OK, The sun is back out, the rain has stopped. Gotta go, You know where. Those black wild Raspberries are calling me. I bet I will stumble over some wild mushrooms on the way. I am going to leave the writing till it is dark and take advantage of the daylight. Listen to my own words of advice. I will catch you on the other side of a bucket of fresh wild berries. Hi Dan, I just moved here in January and wish I would have found your site sooner! I’m looking for a wildcrafting community here- I want to get to know southern ontario! If you have any recommendations for a newcomer, I’m all ears. I’m currently working with a Traditional Healer on Sux Nations reserve, which is amazing, but live in Hamilton. Nya:weh! Hi Stephanie, Lovely to hear from you, and welcome to Southern Ontario. I personally do not know of any organized wildcrafting groups in the area, though I have always wanted to put together something along those lines. Working with a traditional Healer on Six Nations sounds very exiting! I do interpretive walks in the local woods with a focus on sustainable and respectful harvesting, building healthy and mutually beneficial relationships with the plant entities and Nature “Spirits”. I conduct volunteers at the teaching Gardens and Apothecary’s Garden each Saturday morning. I would be happy to talk to you further, and answer any questions you may have, to the best of my ability, if you would like, you are welcome to drop by between 9:30 and noon on a Saturday. My friends through the gardens, Middy and her son Tehaweratennyon, try to come every Saturday to help with the gardens. She also has strong connections with Six Nations and a passion for traditional medicine. You all might benefit from meeting and connecting, if you have not already met each other. The teaching gardens are located at the North foot of Dalewood Avenue by Marion st.,(I think). Dalewood is in the west end by McMaster it runs from main west north through King and Sterling St. and ends at the parking lot by the woods and the Aviary. Not the best instructions, sorry! It is By the Aviary. The entrance is through the parking lot. If you have any problems getting there, my cell phone # is 905-541-2956. If you are not comfortable, or can’t come to the gardens on a Saturday, I am happy to continue the conversation here. Thanks for the info & extended hand 🙂 I didn’t see this til now, but will make an effort to get in touch soon! I’ll be away next weekend, but am sure I’ll stop out to the garden as well. Nature this year in Ontario is a full blown kiss … through the window! Enjoy. With a little bit of tongue! !